On my first morning we decided to take it easy and have a leisurely start to the day, so our first stop at the Emirates Palace Hotel was close to lunch time. We wandered through the luxurious interior of the hotel and then went out to wander through the grounds. By lunch time we decided to sample some of the high tea items on the menu at Le Cafe, one of the coffee shops in the lobby of the hotel. Both of us decided to try one of the specialty coffees. After some debate I chose the Emirates Palace Cappuccino: This is described as a rich espresso topped with frothy fresh milk and decorated with 24 carat gold flakes. My friend picked the Camelccino: another rich espresso topped with frothy camel milk and date syrup. The espresso was indeed rich and full bodied and I loved both the coffee art and the flavours. We also decided to share the the three salmon plate which consisted of three presentations of salmon; a house-smoked salmon, some gravlax, and a honey and coriander cured salmon. 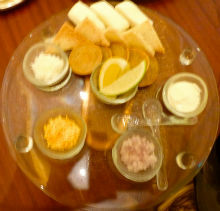 This salmon sampler was served with toast points and traditional accompaniments, lemon, blinis and cream. As the final touch to or light lunch we sampled a caviar, which was presented on ice and complimented with trimmings of egg white, egg yolk, shallots, chives, creme fraiche, blinis and toast points. I always wonder what it is about those tiny salty globules that makes them so appealing but somehow they are. That evening my friend had arranged a dinner where I had the chance to meet a few of the senior colleagues in her department. 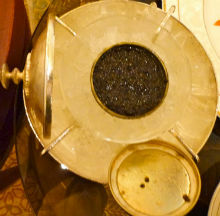 We dined at Agadir, a restaurant serving Moroccan cuisine, in the Westin Abu Dhabi Golf Resort and Spa. It was a glorious evening, warm and with a slight breeze and we sat at a table outside. 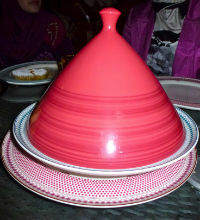 Among the dishes we tried was a vegetable dish served in a beautiful tagine. Tagine Khodar, is a Berber specialty of braised seasonal vegetables with ginger and herbs. I was especially interested in the tagine cooking as I and a group of friends had spent some time last year, experimenting with tagine recipes. 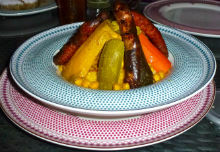 (see Gillian tries out her Tagine! and The SASSY Supper Club Tastes Tagines). Pastilla, is an Andalusian dish first brought to Morocco --from Spain and now a traditional Moroccan dish "perfected" in Fez. Traditionally made with chicken or a pigeon (hmm...), it is baked in a pastry crust and sprinkled with cinnamon. Our dish was made with chicken. The chicken was delightfully tender but overall I found the dish a lot too sweet for my taste. Overall it was a lovely evening; interesting food and good company on a sultry Oriental evening. The following day after we had spent time visiting the hospital department of which mny friend is the head, we took a drive out to visit Al Saadiyat. It was a scorchingly hot day and decided to have a light lunch in the cafe there. We visited Al Saadiyat to see the development of Saadiyat Island where luxury resort villasare being built. We had lunch at Al Fanr restaurant. 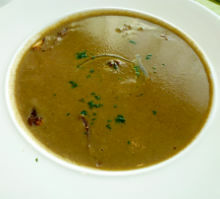 I chose the wild mushroom soup with truffle oil, walnuts, confit duck , served with crispy country bread. Laila had the tomato soup made with marscapone, mozzarella, chives and croutons. 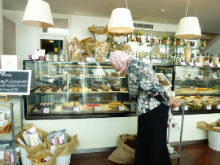 The cafe is part of a specialty foods shop and they had an array of tempting products on display, including a variety of pastries. My savoury tooth spared me from temptation, and both of us resisted dessert. By the time we had walked arounfd the resort area the heat was getting to me, and I had to think about getting packed for the plane ride home later that night. I feel I just skimmed the surface of the many sights, sounds and flavours of the fascinating part of the world but regrettably I don't see myself getting back there very soon. I did however take away with me, a cookbook of Middle eastern recipes to try when I got home.